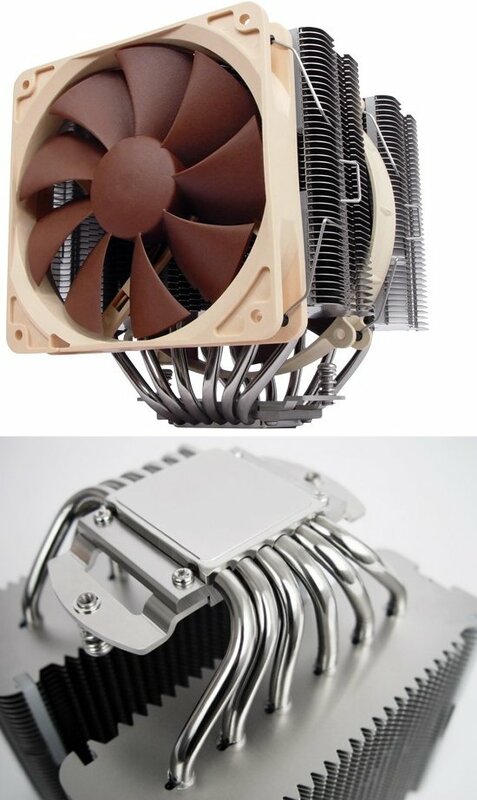 Noctua reveals the NH-D14 SE2011 cooler for Intel's upcoming Sandy Bridge-E series. The product will be available soon for 74.90EUR ($84.90). Noctua today presented a new special edition of its award-winning NH-D14 cooler for the upcoming Intel LGA2011 X79 platform. Having received more than 250 awards and recommendations from the international press, Noctua's NH-D14 has become a benchmark in premium quality quiet cooling. The new SE2011 version is a special edition for Intel's soon to be released Core i7-3000 (Sandy Bridge-E) CPUs and comes equipped with Noctua's SecuFirm2™ mounting system for LGA2011 as well as an exquisite NF-P12/NF-P14 dual PWM fan configuration. "Hardware enthusiasts have every right to be excited about Intel's upcoming Sandy Bridge-E processors, but to get the most out of it, you'll definitely need a high quality cooling solution", says Mag. Roland Mossig, Noctua CEO. "Our flagship model NH-D14 has earned a reputation as one of the finest high-end quiet coolers on the market, so we thought that this should be a perfect match. The new special edition for LGA2011 will keep your Sandy Bridge-E CPU cool no matter what you throw at it, and it will do so at minimum noise levels, thus appealing to overclockers and quiet enthusiasts alike." Noctua's award-winning NH-D14 heatsink features a 6 heatpipe dual radiator design that provides more surface area, better heat-distribution and superior airflow efficiency than conventional tower style heatsinks. Developed to provide ultimate quiet cooling performance in dual fan mode, the NH-D14 is renowned to be among the best premium-grade CPU coolers available. The new SE2011 model combines the proven NH-D14 heatsink with the latest SecuFirm2™ mounting system for LGA2011 as well as novel PWM versions of Noctua's much acclaimed NF-P12 and NF-P14 fans. Supporting fully automatic PWM speed control, the SE2011's NF-P12 and NF-P14 fans use Noctua's new, custom designed NE-FD1 PWM IC that integrates Smooth Commutation Drive (SCD) technology and thus makes them quieter at lower speeds. Topped off with Noctua's popular NT-H1 thermal compound and full 6 years manufacturer's warranty, the NH-D14 SE2011 is an elite choice for an elite platform.